Aquarius is one of three undersea laboratories in the world dedicated to science and education. Two additional undersea facilities, also located in Key Largo, FL are owned and operated by Marine Resources Development Foundation. Aquarius was owned by the National Oceanic and Atmospheric Administration (NOAA) and operated by the University of North Carolina–Wilmington until 2013 when Florida International University assumed operational control. Aquarius, designed by Perry Submarine Builders of Florida and constructed by Victoria Machine Works, was built in Victoria, Texas, in 1986. Its original name was "the George F. Bond", who was the father of Sealab in particular and saturation diving in general. Underwater operations were first planned for Catalina Island, California, but were moved to the U.S. Virgin Islands. Following Hurricane Hugo in 1989, Aquarius was taken to Wilmington, NC for repairs and refurbishment and was redeployed in the Florida Keys in 1993. Aquarius is located under 20 m (66 ft) of water at the base of a coral reef within the Florida Keys National Marine Sanctuary, an ideal site for studying the health of sensitive coral reefs. The laboratory is most often used by marine biologists for whom Aquarius acts as home base as they study the coral reef, the fish and aquatic plants that live nearby and the composition of the surrounding seawater. Aquarius houses sophisticated lab equipment and computers, enabling scientists to perform research and process samples without leaving their underwater facilities. The habitat accommodates four scientists and two technicians for missions averaging ten days. Scientists on the Aquarius are often called "Aquanauts" (as they live underwater at depth pressure for a period equal to or greater than 24 continuous hours without returning to the surface). A technique known as saturation diving allows the aquanauts to live and work underwater for days or weeks at a time. After twenty four hours underwater at any depth, the human body becomes saturated with dissolved gas. With saturation diving, divers can accurately predict exactly how much time they need to decompress before returning to the surface. This information limits the risk of decompression sickness. By living in the Aquarius habitat and working at the same depth on the ocean floor, Aquarius aquanauts are able to remain underwater for the duration of their mission. In addition, because Aquarius allows saturation diving, dives from the habitat can last for up to nine hours at a time; by comparison, surface dives usually last between one and two hours. These long dive times allow for observation that would not otherwise be possible. Way stations on the reef outside Aquarius allow aquanauts to refill their scuba tanks during dives. Aquarius consists of three compartments. Access to the water is made via the 'wet porch', a chamber equipped with a moon pool, which keeps the air pressure inside the wet porch the same as the water pressure at that depth ('ambient pressure'), about 2.6 atmospheres, through hydrostatic equilibrium. The main compartment is strong enough, like a submarine, to maintain normal atmospheric pressure, and can also be pressurized to ambient pressure, and is usually held at a pressure in between. The smallest compartment, the Entry Lock, is between the other two and functions as an airlock in which personnel wait while pressure is adjusted to match either the wet porch or the main compartment. This design enables personnel to return to the surface without the need for a decompression chamber when they get there. Personnel stay inside the main compartment for 17 hours before ascending as the pressure is slowly reduced, so that they do not suffer decompression sickness after the ascent. 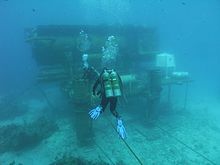 Since 2001, NASA has used Aquarius for its NEEMO (NASA Extreme Environment Mission Operations) analog missions, sending groups of astronauts to simulate human spaceflight space exploration missions. Much like space, the undersea world is a hostile, alien place for humans to live. 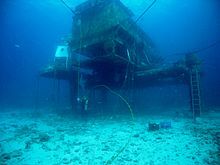 NEEMO crew members experience some of the same challenges there that they would on a distant asteroid, planet or moon. During NEEMO missions in Aquarius, the aquanauts are able to simulate living on a spacecraft and test spacewalk techniques for future space missions. The underwater condition has the additional benefit of allowing NASA to "weight" the aquanauts to simulate different gravity environments. A diver named Dewey Smith died during a dive from Aquarius in May 2009. A subsequent investigation determined that Smith's death was caused by a combination of factors, including the failure of the electronic functions of his Inspiration closed circuit rebreather due to hydrodynamic forces from a hydraulic impact hammer being used nearby. Due to budget cuts, NOAA ceased funding Aquarius after September 2012, with no further missions scheduled after a July 2012 mission that included pioneering female diver Sylvia Earle in its aquanaut crew. The University of North Carolina Wilmington was also unable to provide funding to continue operations. The Aquarius Foundation was set up in an attempt to keep Aquarius functioning. In a two-week series the daily cartoon strip Sherman's Lagoon featured the potential closing of the Aquarius facility in the week starting September 10, 2012, and continued with a cameo appearance of Sylvia Earle in the week starting September 17, 2012, to discuss the importance of Aquarius. In January 2013, a proposal to keep Aquarius running under Florida International University administration was accepted. From June 1 to July 2, 2014, Fabien Cousteau and his crew spent 31 days living and working in Aquarius in tribute to Jacques Cousteau's 30-day underwater expedition in 1963. Cousteau estimated the team collected the equivalent of two years' worth of surface diving data during the mission, enough for ten scientific papers. ^ Shepard, Andrew N.; Dinsmore, David A.; Miller, Steven L.; Cooper, Craig B.; Wicklund, Robert I. (1996). "Aquarius undersea laboratory: The next generation". In: MA Lang, CC Baldwin (Eds.) the Diving for Science…1996, "Methods and Techniques of Underwater Research". Proceedings of the American Academy of Underwater Sciences (Sixteenth annual Scientific Diving Symposium). Retrieved February 26, 2012. ^ a b Ho, Leonard (15 January 2013). 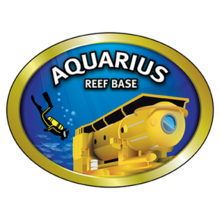 "It's Official: Aquarius Reef Base still in business". Advanced Aquarist. Pomacanthus Publications. Retrieved 17 January 2013. ^ Kesling, D; Berey, R (1989). "Training, equipment, and operational procedures for conducting scientific saturation diving activities". In: Lang, MA; Jaap, WC (ed). Diving for Science…1989. Proceedings of the American Academy of Underwater Sciences annual scientific diving symposium 28 September - 1 October 1989 Wood Hole Oceanographic Institution, Woods Hole, Massachusetts, USA. Retrieved 2013-04-16. ^ Hellwarth, Ben (2012). Sealab: America's Forgotten Quest to Live and Work on the Ocean Floor. New York: Simon & Schuster. p. 259. ISBN 978-0-7432-4745-0. LCCN 2011015725. ^ Prager, Ellen J. (2008). Chasing Science at Sea: Racing Hurricanes, Stalking Sharks, & Living Undersea With Ocean Experts. Chicago, London: The University of Chicago Press. p. 113. ISBN 978-0-226-67870-2. ^ a b Hellwarth, pp. 260-261. ^ Stone, Gregory (September 2003). "Deep Science @ National Geographic Magazine - National Geographic Online Extra". National Geographic Society. Archived from the original on 2007-10-17. Retrieved February 29, 2012. ^ a b c d Prager, pp. 118-120. ^ Helvarg, David (March 20, 2011). "Health Library Articles". HealthDay. Retrieved February 25, 2012. ^ Public Affairs, UCT2 (January 2006). "Seabee Divers Help NOAA Restore Aquarius Undersea Lab" (PDF). Faceplate. 9 (1): 10, 20. Archived from the original (PDF) on February 17, 2013. Retrieved February 28, 2012. ^ Staletovich, Jenny (September 27, 2017). "Irma battered, but didn't beat, this beloved underwater lab". Miami Herald. Retrieved October 1, 2017. ^ Silk, Robert (May 9, 2009). "Aquarius diver's death remains a question". Key West Citizen. Cooke Communications. Archived from the original on March 26, 2010. Retrieved January 25, 2012. ^ Lam, Brian (July 13, 2012). "Searching for the Ocean's Secrets From the Last Undersea Base". Gawker Media. Retrieved August 13, 2012. ^ Hellwarth, Ben (August 3, 2012). "How Humans Learned To Live Under Water". Gawker Media. Retrieved August 13, 2012. ^ Support (September 17, 2012). "This Week in Comics: What To Read - DailyINK Blog". King Features Syndicate. Archived from the original on September 19, 2012. Retrieved September 18, 2012. ^ Alyssa Newcomb (July 2, 2014). "Fabien Cousteau Calls the Ocean 'Second Home' After 31-Day Undersea Mission". Good Morning America. ABC News. Retrieved July 2, 2014. ^ "5 Things to Know About Cousteau's Undersea Mission". ABC News. AP. July 2, 2014. Retrieved July 2, 2014. ENN. Age of Aquarius: Undersea lab immersed in coral reef research, 2000. Wikimedia Commons has media related to Aquarius (laboratory).